This post is not comfortable to write – I would like to share with you some of the mistakes, problems, issues, and solutions that I have encountered in my two decades of technology management. This issue is the most important to me – it is also the one that has affected me most recently. One of the largest challenges that people working for companies face is that of workplace bullying. Persistent abuse – verbal, emotional, or physical – in much more common in Canada (where I am) than you think; up to 40% of workers report being bullied. This is not acceptable! So, as for my mistake, in my most recent job, I acted as a meat shield between this person and my developers; this was not fun, of course, but I believe that regardless of how this person treats me, my main job is protect my people. I was unable to do this all of the time, however, as I could not be everywhere. What I should have done was report this person to the company’s owner – I did not. I regret this decision and paid for it during the layoffs that occurred later; my supervisor did not like anyone interfering with his bullying. I made an error in not addressing the problem at the source; however, the upside is that I will not be allowing this to happen in the future. It cost me and the people that I managed too much. I am unsure what to do about this individual – I have been reaching out to the affected individuals as much as I can without falling afoul of the non-compete agreement that I signed. One person has already left, one is about to give notice, and the a third is essentially waiting for a hobby position to become a paid one before leaving. This is obviously not enough but I still do not know what to do about this person. Anyone have any ideas? Early in my career, I thought that if I found the perfect process or tool, I would be able to tap into an everlasting font of productivity. This was nonsense, of course, but it is something that anyone has to grow through. Having said that, I believe that a good selection of tools can assist and improve collaboration, particularly for remote teams, but they cannot substitute for good practices and people (for more detail on those tools that I do suggest, please check out my post on preferred tools). This is the worst ‘mistake’ in my opinion because it can lead easily into the other two, as well as causing other problems. The main problem with this one is that it can trip you up and cause you problems without you realizing it. It certainly made things worse for the bullying issue that I reported earlier and is probably the cause of the bullying in the first place. It also will lead to making mistakes in the first place, overreacting to those mistakes when they are made, failing to capitalize on opportunities due to indecision, and many, many other issues. Lack of confidence is a pernicious issue; it affects you at every level of your career. The most recent incarnations of this problem for me are bouts of impostor syndrome. I am suffering from this even as I write this – will people want this? what right do I have to write or talk about this? what makes me think that I can talk about this? How about all of you? 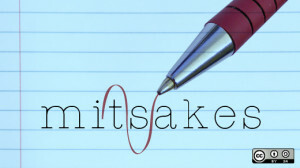 When, if at all, have you made any of these mistakes – what happened?